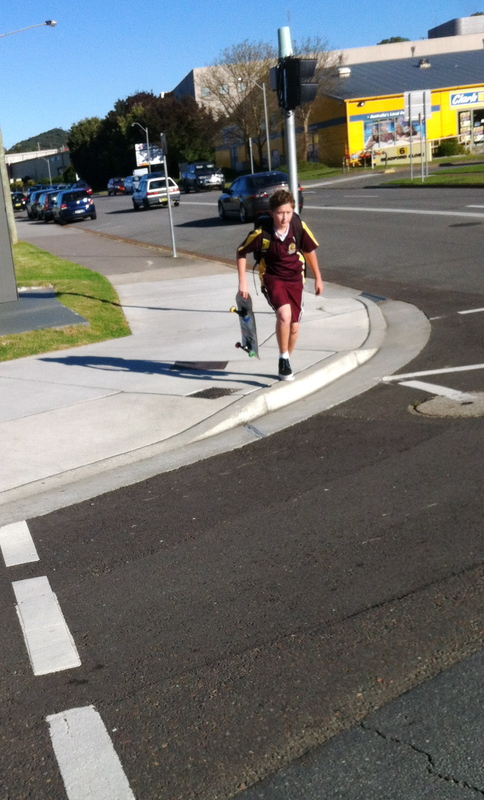 Is skateboarding the new way to get to school? 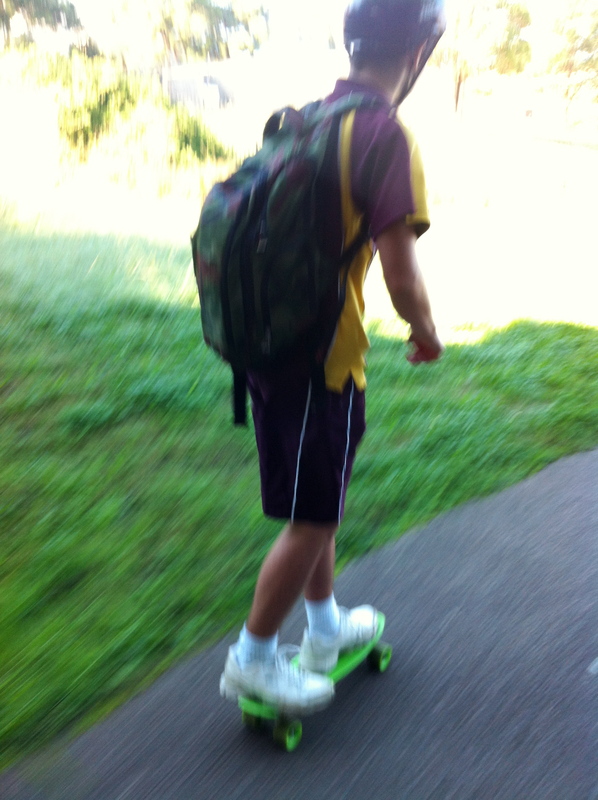 Yesterday I saw two boys skateboarding to school. It is fast, very safe on the separated bike track, good exercise and they have the added bonus that once they are at school, they can carry the board with them and possibly use it during the day to get around at school. I saw several commuters in Sydney on skateboards, using them on the paths and the roads to get to work wearing business attire. Skateboards may no longer be just the domain of kids anymore …. This entry was posted in bicycle culture, Street cyclist and tagged Adamstown, newcastle, skateboarding. Bookmark the permalink. 6 Responses to Is skateboarding the new way to get to school? Well I’m 65 and it might be a bit late to lean to ride a skateboard. I think I’ll stick to riding my Bennett. A Bennett mixte! How cool! I agree that 65 is a little late to learn to ride a skateboard, I gave up riding mine at around 16 after I had a fall, no bad injuries thankfully, just a few stitches, but I don’t want to repeat it. I mostly see college kids getting around on skateboards. Annie, great to hear it is not just there that they are being used, I think they are a great way to get around if you have the balance and skills. Greg, my skateboard would have predated yours, it was made from a rollerskate screwed to a piece of wood. From memory, I traded a skate for the piece of wood with the kids who lived up the street and we made matching skateboards. They went pretty fast too and we lived in a street where there was little traffic and was newly resurfaced – halcyon days! Wonderful to hear of a 40+ year old still riding a skate board too. 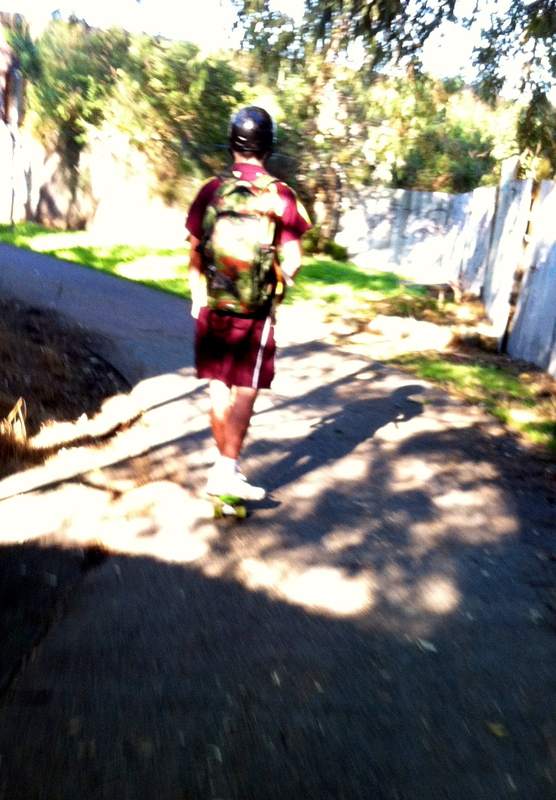 I see college kids getting around by skateboard almost as much as by bike. An inexpensive way to get around and fun, or so it seems. Naturally, I am too concerned about a closed head injury to give it a try myself.